The catalogues of two further series of the Opie Archive have now been completed and are available to search online here. Series B comprises the Opies’ working papers and research materials, while Series C consists of material relating to the Opies’ publications. The first part of the working papers series contains a collection of 239 subject files, stored in 105 boxes (MSS. Opie 47-151). Compiled by Iona Opie, in the days before Excel spreadsheets, this series of subject files represents a large, analogue database of all the Opies’ research materials, which formed the basis of their published works. The files cover a range of topics, such as nursery rhymes, children’s songs, games and playground lore, as well as their historical, literary, sociological and geographical context. They contain research notes and drafts, extracts of material written by children in response to the Opies’ school surveys, newspaper cuttings, journal articles, letters from the Opies’ many correspondents, photographs, postcards and other ephemera. The subject files were added to over a number of years, largely from the 1940s to the 1980s and -’90s, although several files also include older collected material, such as extracts of material on children’s games gathered by A.S. Macmillan in 1922 and sent to the Opies by his daughter. The Opie working files are housed in their original ‘Loxonian’ binders from circa the 1940s-1950s, which will be of interest to any connoisseurs of vintage stationary. 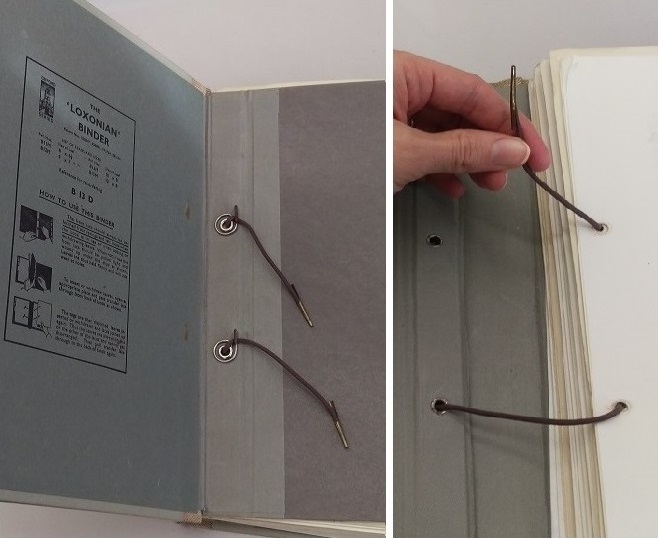 These ingenious hardcover binders come with laces, much like shoe laces, which hold the sheets in place, and are then fastened at the front with metal spiral clips. As far as possible, the arrangement of the files aims to reflect the Opies’ own original file order, based on their numbered or alphabetical file titles; otherwise the files are arranged chronologically, according to the publication date of the various Opie books to which the files relate. However, not all of the material collected by the Opies made it into their published books. For instance, some of the collected songs, rhymes and jokes contained in the ‘Improper’ files in MS. Opie 61, are surprisingly bawdy, and certainly could not have been included in a book like The Lore and Language of Schoolchildren back in 1959. Nevertheless, even those relatively innocent verses that did make it into this book, were too strong for some; a few amusing newspaper clippings from 1966, contained in MS. Opie 75, tell of a substitute teacher who was reprimanded after scandalised parents complained about the ‘saucy’ verses he had read aloud from the Opies’ Lore and Language book to a class of 13-year-old pupils. Some unexpected items found inside some of the subject files included a Kellogg’s Crunchy Nut cereal box from the 1990s with a Humpty Dumpty ‘spot the differences’ puzzle on the back, contained in a file on nursery rhymes, a ring tab from a tin can in a section on ‘projectiles’ within a file on children’s activities, various football and baseball trading cards, some 1970s crisp packets, a 1980s ‘friendship pin’ created using a safety pin and colourful beads, to be worn attached to one’s shoe laces or lapel, and even some samples of grasses, from the 1960s, which children used to bind together in clusters to create miniature trees. 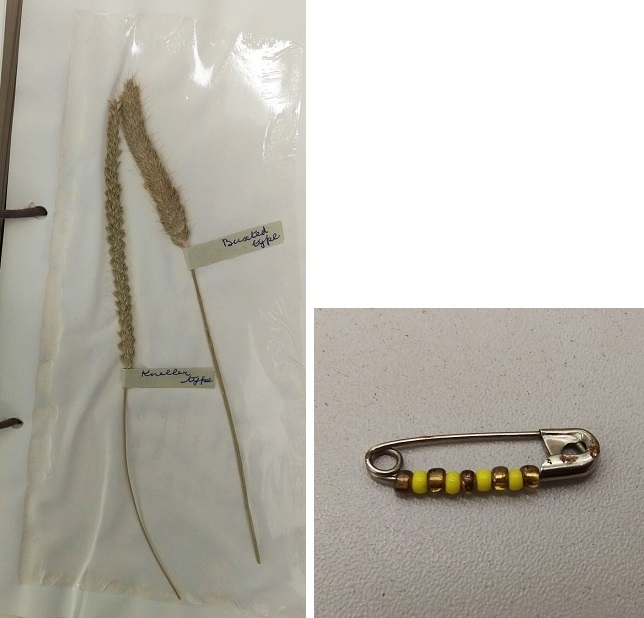 The grass samples, which were stuck down under a sheet of cellophane, were duly examined by our Conservation department, but were fortunately pronounced safe, in archive preservation terms. Additional material, also relating to the Opies’ work and research, which did not originally belong to their pre-existing collection of subject files, was added onto the end of the Working Papers series, but in a separate sub-series (MSS Opie 152-168). This includes material on children’s books, further research notes, scrapbooks, newspaper cuttings files, and even the Opies’ library tickets and bibliographical notes, which show the vast number of books they consulted in the course of their research. The fruits of all this research can be seen in Series C of the Opie Archive, which contains material relating to the Opies’ publications. This material shows how Peter and Iona’s published works took shape, including manuscripts, corrections, paste-ups, and proof copies, as well as correspondence with publishers, concerning the process of planning and producing their books. The reception of these books, once they were finally released into the world, is documented in the press cuttings of book reviews, carefully saved up (one imagines, with some pride) by the Opies. Aside from their books, other Opie productions are likewise included in this series, such as various articles, lectures, exhibitions and broadcasts. Moreover, any Opie enthusiasts will be particularly interested in the tantalising glimpse of further Opie works which might have been, offered by papers relating to book proposals and publishing projects which were never realised. Please be aware that work on the remaining Opie Archive is still ongoing, and parts of the archive will continue to become temporarily unavailable whilst preservation and cataloguing work is being carried out. We aim to accommodate urgent researchers’ requests for access wherever possible, however, if you do need to consult uncatalogued material from the Opie Archive before June 2018, please ensure that you contact us with as much advance notice as possible, so that we can advise on the availability of the material in question and make any necessary arrangements. The Opie cataloguing project is generously funded by the Wellcome Trust.